The Vietnamese delegation led by the Ministry of Industry and Trade (MoIT) and 20 businesses participated in a series of events in Italy to cement partnerships and help Vietnamese goods enter the European nation’s market. The Vietnamese delegation also held a show of Vietnam’s flagship farm produce and beverages in Bologna, along with a business-to-business forum, gathering many local enterprises, including LegaCoop cooperative federation and Coop Italia and Conad distribution networks, to help Vietnamese goods make inroads into Italy. 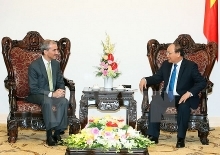 Deputy Minister Thoa also noted the growing cooperation between Vietnam and Italy, especially in trade. Bilateral trade surged from 0.7 billion USD in 2005 to 4.3 billion USD in 2015, rising by some 19 percent annually. 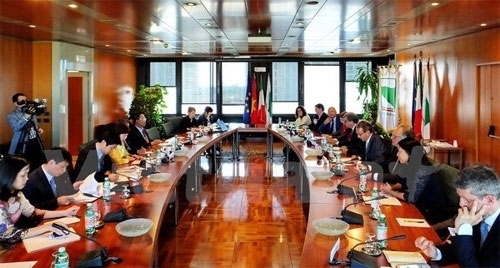 The Vietnam – Italy joint committee on economic cooperation have convened two meetings during which they reached many agreements between their ministries and enterprises. Those agreements create optimal conditions for businesses to seek investment opportunities, Thoa stressed. Vietnam has inked free trade agreements with 17 of the 20 economies in the G20 and all G7 members, while boasting intensive links with 55 economies with tariffs on more than 90 percent of imported goods from those economies cut to 0 percent. During the working visit in Italy, Deputy Minister Thoa had a working session with officials of the Emilia Romagna region. She said she hopes the region will share its experience and technologies in agriculture, the food industry and other sectors. It should also expand investment and business activities in Vietnam.